It has been a while since I did any work on the Champion. The car has been running great and I have been spending way too much time working. What free time I have has been spent on my Jeepster project. But while driving home at dusk I realized the instrument lights are super dim. They are on in the picture above. Pretty sad. This is the dimmer for the lights. I suspect this is the problem because if it move it at all the lights go off entirely. As you can see the wiring under the dash is a rat’s nest. I removed the two screws and took out the rheostat. While I was at it I reached up and removed the two lamp sockets that light the gauges. I just want to make sure the bulbs are good and the sockets clean. It turns out the bulbs are good. 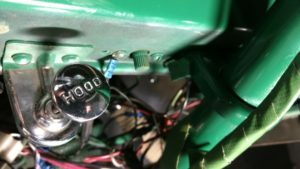 The rheostat is an open design. 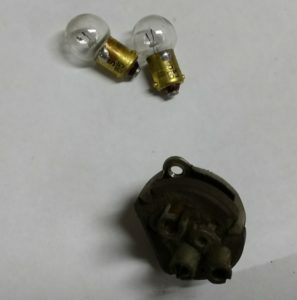 One of the terminals on the back is tied to a coil of resistance wire. 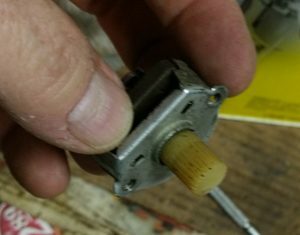 The other terminal ties to a brass wiper that is attached to the knob. When you turn the knob the wiper moves over the coil of wire effectively making the wire longer or shorter. This varies the resistance and therefore the brightness of the bulbs. Right now the lowest resistance I can get is 4Ω. That is not a lot but it not 0Ω, which is what we want. Time to clean. 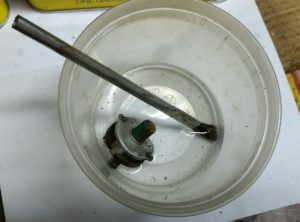 I first used naphtha to clean out the rheostat. I forgot to take a picture but the naphtha turned black. Here I am cleaning it out again, this time with alcohol. This looks a lot cleaner. 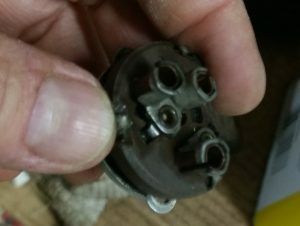 The rheostat does not appear to be damaged. Notice the one terminal has two sockets on it. That is interesting. If this does not work I can bypass the rheostat simply be connecting both wires to the same terminal. I will no longer be able to dim the lights but why would I do that? There is over-spray on the knob from when the car was painted. I decided to see what I could do about that. I used a tiny screwdriver to scrape off the paint. It was not stuck on the there very well and came right off. Nobody can see this so it was sort of a waste of time. But I will know. After all that we are down to 2.9Ω. I was hoping for better. 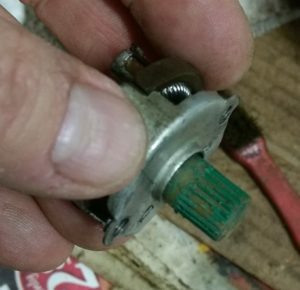 So when I put the rheostat back in there I bypassed it. Imagine my surprise when I turned the lights on and NOTHING worked. 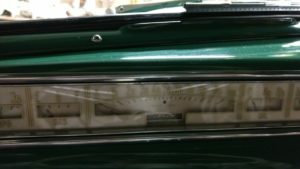 No headlights, taillights, or interior lights. So the culprit turned out to be that little wire tied to one of the screws. I am not sure how this thing is wired but it seems like the entire lighting circuit is being grounded through a little 20ga wire. That is a little scary. So now the lights work again but the instrument lights are not a lot brighter. So I did what I should have done from the start. 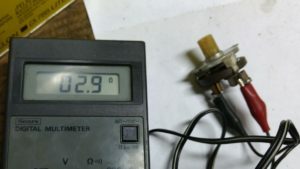 I checked the voltage at the rheostat. 5.08 volts. The battery is putting out 6.14 volts. 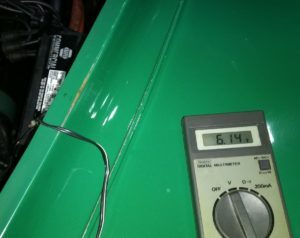 That means we are losing 18% of our voltage in the wiring between the battery and the rheostat. That is totally uncool. 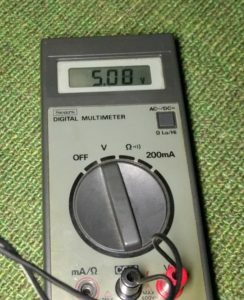 6V electrical systems are VERY sensitive to dirty, rusty, or loose connections. So now I will have to trace the circuit and figure out where the losses are. 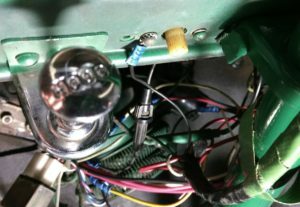 Bad grounds and dirty switches are the most likely but that stupid little ground wire makes me think it could be anything. But I am out of time for tonight.